Back in the 60’s we watch a young boy take a chainsaw to an environmental protester who attacked his father. Jumping to the modern day, we meet a van full of hippies on their way to the ‘American Free Love Festival’. The festival is a barely controlled mess, the owner, Frank (Paul Reubens) doesn’t seem interested in keep things sane, and the local sheriff, Buzz (Thomas Jane) is in over his head trying to keep the peace. To make things worse, waiting in the woods for an any wandering stoners is an axe wielding maniac who looks suspiciously like Ronald Reagan. 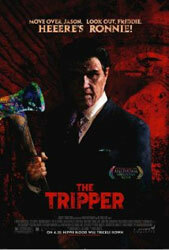 ‘The Tripper’ is a very satirical take on not only the moralistic attitudes of most slasher films, but conservatives and hippies alike. Primarily this film is a comedy but thankfully it doesn’t skimp on tense stalking scenes or gore. The Reagan slasher is used sparingly, so when he does appear on camera he retains his menace. The climax where one of the survivors is tripping on LSD and has a showdown with the killer is surprisingly harrowing.